은 조선 중기의 문신인 유근(柳根)의 초상화로, 가로 89㎝, 세로 163㎝ 크기이며 비단에 채색하여 그렸다. 유근(1549∼1627) 선생은 문장에 뛰어나 외국사신들에게 이름을 떨쳤으며, 임진왜란 때 명나라와의 관계에서도 많은 일을 하였다. 이 초상화는 정장 관복 차림을 하고 앉아 있는 전신상이다. 오른쪽을 바라보고 손은 앞으로 모아 소매 안에 넣은 자세를 하고 있다. 머리에는 높이가 상당히 낮은 모자를 쓰고 있는데, 이는 조선 중기 관모의 형태를 반영한 것이다. 얼굴은 엷고 밝은 살색을 띠고 있으며 가슴에는 공작과 모란무늬가 수놓아진 흉배를 하고 있다. 관복의 오른쪽으로는 트임이 있어 청색과 녹색의 안감이 드러나 있다. 바닥은 여러 가지 짙은 빛깔로 화려하게 꾸민 양탄자가 깔려 있다. 이 영정은 선생이 71세가 되던 해인 광해군 11년(1619)에 그려졌는데, 임진왜란 때 왕을 모신 공으로 진원부원군에 봉해져 그려진 것으로 보이는 진본이다. 17세기 공신초상화를 대표할 만한 작품으로 엄중한 표현형식을 나타내고 있다. 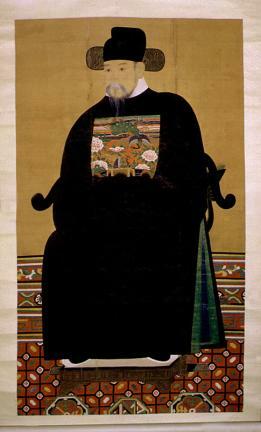 This portrait of Yu Geun, a scholar-official of mid-Joseon is 89cm by 163cm and is painted in ink and color on silk. Yu Geun (1549-1627) was noted for his penmanship in his time with his reputation known even to foreign envoys visiting Joseon. During Imjin Waeran (Japanese Invasion of 1592), he was actively involved in activities having to do with relations with the Ming Dynasty. In this full-length portrait, Yu Geun is shown in formal attire, donning a court official’s costume. The eyes are cast toward the right, and the two hands, gathered in front of him, are hidden inside the sleeves. The hat has a very low peak, true to the mid-Joseon style in court official’s headgears. The face is painted in a sheer layer of a bright flesh color. The embroidered patch at the chest features a peacock with peony flowers. Through the opening at the right side, the blue and green linings of the costume are visible. The floor is covered with a sumptuously-patterned carpet in various deep color tones. The portrait was realized in 1619 (the 11th year of Gwanghae’s reign) when Yun Geun was seventy-one years of age. It was painted on the occasion of bestowal of the tile “Jinwonbuwongun” for having escorted the king to safety during the war. This original copy of Yu Geun’s portrait, amongst the finest examples of 17th-century meritorious retainer portraits, is rigorously faithful to Joseon’s portrait style for court officials.